The First Shazam! 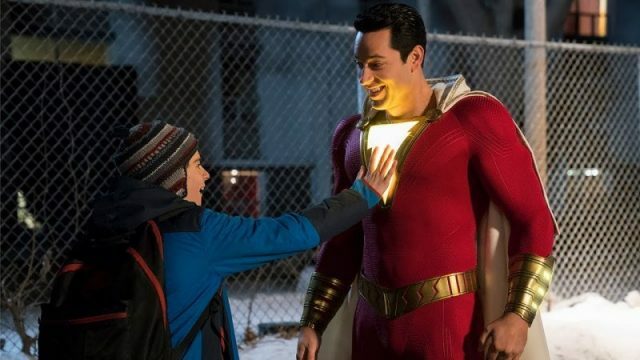 Reviews Call DC's Latest Film "Electrifying"
Shazam! has its work cut out for it when it opens in a few weeks. DC’s post-Aquaman film is kicking off a month that includes a new Hellboy movie, Avengers: Endgame, and the “other” Captain Marvel movie that’s still going to be hanging around at the box office. Fortunately, the early reviews for Shazam! have been glowing; and that might allow the original Captain Marvel to soar. Currently, Shazam! is sitting on 97% Fresh rating on Rotten Tomatoes. Negative reviews are few and far between, at least so far. This is all very good news for the film’s success at the box office. However, the early projections have Shazam! coming in at around $45 million during its opening weekend. Strong word of mouth can potentially carry it higher. But we’ll have to wait until April 5 to see how it actually performs in theaters. What do you think about the first Shazam! Reviews? Do you believe the film will outperform its box office projections? Let us know in the comment section below!